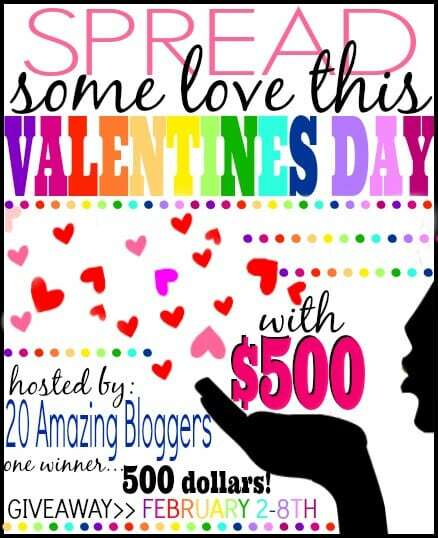 We’re Spreading the Love With a $500 Giveaway! The answer was pretty simple: CASH…lots of it. So, for this Valentine’s Day giveaway, we’re offering up $500 in the form of a Visa gift card or Paypal cash (winner’s choice). Sound good?! You can use that $500 to take your spouse out for a romantic dinner, visit the spa with your bestie, treat the kids to a session at that new pottery painting place or treat yourself to something special that you’ve been dreaming of forever. Whatever you want! We just want you to know how much we love you ALL, so we’re picking up the tab this time for one super lucky reader. Enter via the Rafflecopter form below – good luck! « Football Themed Pizzas – Perfect for the Big Game! I’m making sweet treats for my family and friends. Mailing valentine’s to all my grandkids! Even those who live close since they all love to get mail. Last year, I made a romantic dinner. I would love to do it again this year…. Valentine’s Day is just another day at our house (except for the kiddos). We will be making a special valentine’s day dinner with our 3 beautiful kids! I want to have my family over for dinner. I will write letters of encouragement to the missionaries in my family and the older folks I know who can’t get out often. I love to give treats to my kids and grandkids on Valentine’s Day. I was thinking a nice quiet evening at home with my hubby, but I’m not sure that is in the stars. Love your creativity, my kids and I have enjoyed doing some of your crafts. Valentines Day will be spent at home and has ben for the last 46 years, we gave up going out on the holiday because everything is so crowded and I will cook and watch movie and we have a good evening and then we will go out to eat at another time.